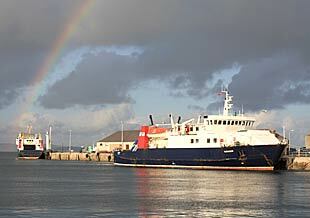 Orkney Ferries could face service disruption. Members of the maritime union Nautilus International have voted by a massive majority in favour of taking industrial action in the latest stage of a long-running pay dispute with Orkney Ferries. Nautilus says it has informed Orkney Ferries of the result and has indicated its willingness to meet management for further discussions on the issues. National ferry organiser Micky Smyth commented: “The ballot results are very clear and reflect the long-running frustration of our members about their pay and conditions. “Independent research conducted in response to those concerns demonstrated that the salaries of our Orkney Ferries members are around 10% below those of other officers carrying out the same duties in comparable ferry companies. “Our 2017 pay claim – which was submitted whilst we were discussing the results of the study with management – sought an increase over the March RPI inflation rate of 3.2%, as well as a further seven days of annual leave entitlement. The news comes just after the RMT union confirmed last month that its members on Orkney Ferries will be taking industrial action in a dispute over pay, beginning this week. The union’s national executive committee instructed all RMT members at Orkney Ferries to take part in industrial action from Wednesday, January 3. Members were instructed to not work any call-back, not work any overtime, and to work to the job description only. When asked for a comment on the latest development, an Orkney Islands Council statement said: “The industrial action announced so far by two of the three ferry unions presents a considerable challenge for Orkney Ferries. Although we will make every effort to mitigate the potential impact, there is the risk of service disruption.